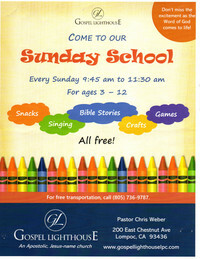 The Gospel Lighthouse has, to quote some of our younger attendees, "the fun-est Sunday school ever!" Ages 3 - 12 have their own classes with singing, skits, puppet shows, Bible stories, crafts, games, and snacks; all centered around learning about Jesus, the Bible, and Christian living. Ages 13 and up have their own class with worship and Bible teaching centered around a better understanding of who Jesus is and practical guidance to live a victorious Christian life. Whatever your age you will find what you and your family need at 10 a.m. each Sunday morning. 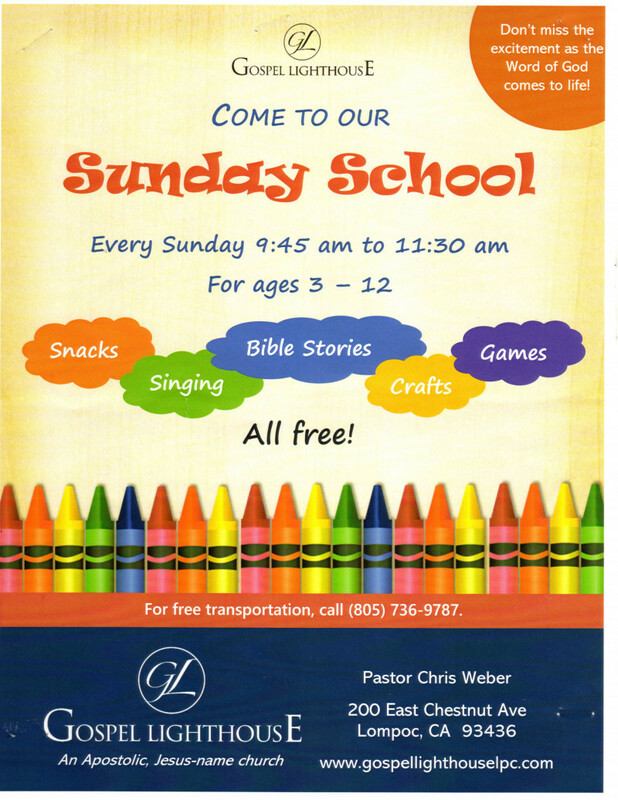 We offer free transportation to and from our Sunday school on our fun Sunday school van. Just call 805-736-9787, leave a message.